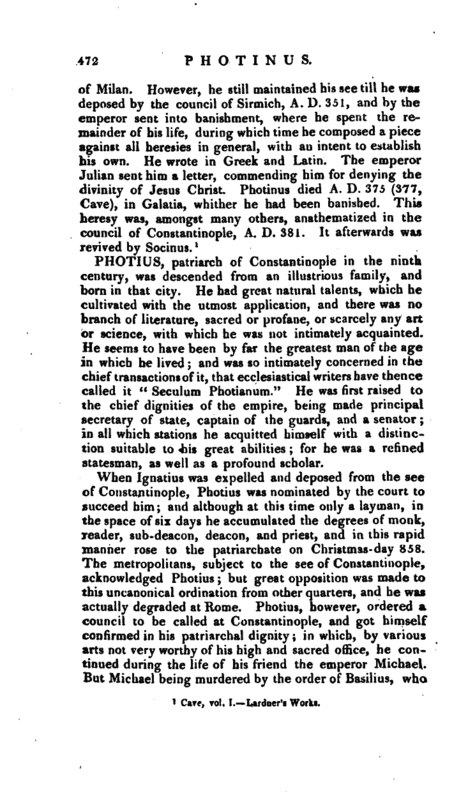 , patriarch of Constantinople in the ninth century, was descended from an illustrious family, and born in that city. He had great natural talents, which he cultivated with the utmost application, and there was no branch of literature, sacred or profane, or scarcely any art or science, with which he was not intimately acquainted. He seems to have been by far the greatest man of the age in which he lived; and was so intimately concerned in the chief transactions of it, that ecclesiastical writers have thence called it “Seculum Photianum.” He was first raised to the chief dignities of the empire, being made principal secretary of state, captain of the guards, and a senator; in all which stations he acquitted himself with a distinction suitable to his great abilities for he was a refined statesman, as well as a profound scholar. 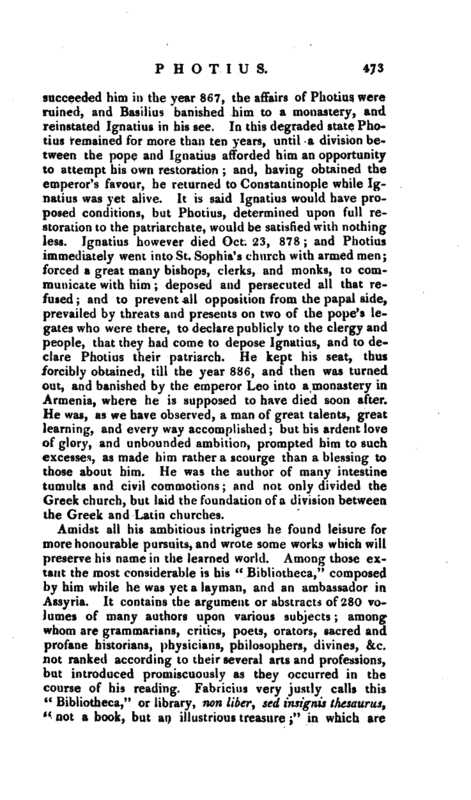 When Ignatius was expelled and deposed from the see of Constantinople, Photius was nominated by the court to succeed him; and although at this time only a layman, in the space of six days he accumulated the degrees of monk, reader, sub-deacon, deacon, and priest, and in this rapid manner rose to the patriarchate on Christmas- day 858. The metropolitans, subject to the see of Constantinople, acknowledged Photius; but great opposition was made to this uncanonical ordination from other quarters, and he was actually degraded at Rome. Photius, however, ordered a council to be called at Constantinople, and got himself confirmed in ‘his patriarchal dignity; in which, by various arts not very worthy of his high and sacred office, he continued during the life of his friend the emperor Michael. But Michael being murdered by the order of Basilius, who | succeeded him in the year 867, the affairs of Photius were ruined, and Basilius banished him to a monastery, and reinstated Ignatius in his see. In this degraded state Photius remained for more than ten years, until a division between the pope and Ignatius afforded him an opportunity to attempt his own restoration; and, having obtained the emperor’s favour, he returned to Constantinople while Ignatius was yet alive. It is said Ignatius would have proposed conditions, but Photius, determined upon full restoration to the patriarchate, would be satisfied with nothing less. Ignatius however died Oct. 23, 878; and Photius immediately went into St. Sophia’s church with armed men; forced a great many bishops, clerks, and monks, to communicate with him; deposed and persecuted all that refused; and to prevent all opposition from the papal side, prevailed by threats and presents on two of the pope’s legates who were there, to declare publicly to the clergy and people, that they had come to depose Ignatius, and to declare Photius their patriarch. He kept his seat, thus forcibly obtained, till the year 886, and then was turned out, and banished by the emperor Leo into a monastery in Armenia, where he is supposed to have died soon after. He was, as we have observed, a man of great talents, great learning, and every way accomplished; but his ardent love of glory, and unbounded ambition, prompted him to such excesses, as made ’him rather a scourge than a blessing to those about him. He was the author of many intestine tumults and civil commotions; and not only divided the Greek church, but laid the foundation of a division between the Greek and Latin churches. Amidst all his ambitious intrigues he found leisure for more honourable pursuits, and wrote some works which will preserve his name in the learned world. Among those extant the most considerable is his “Bibliotheca,” composed by him while he was yet a layman, and an ambassador in Assyria. 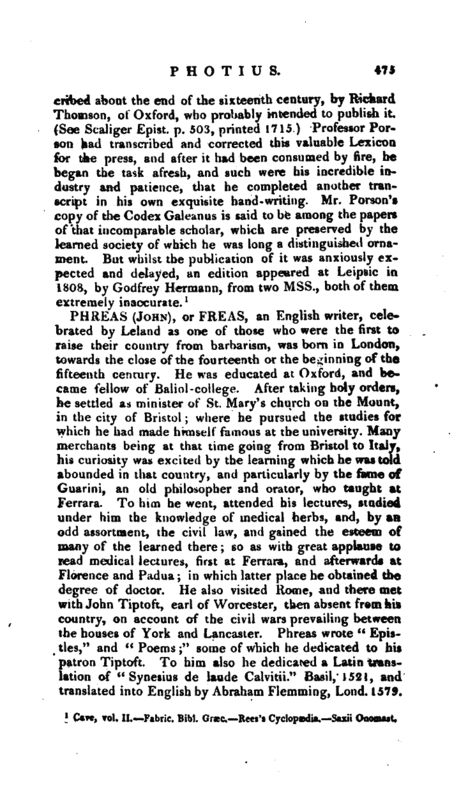 It contains the argument or abstracts of 280 volumes of many authors upon various subjects; among whom are grammarians, critics, poets, orators, sacred and profane historians, physicians, philosophers, divines, &c. not ranked according to their several arts and professions, but introduced promiscuously as they occurred in the course of his reading. Fabricius very justly calls this “Bibliotheca,” or library, non liber, sed insignis thesaurus, “not a book, but an illustrious treasure” in which are | contained many curious things relating to authors, and many fragments of works which are no where else to be found. It was first brought to light by Andreas Schottus, and communicated by him to David Hoeschelius, who caused it to be printed in 1601, at Vienna, in Greek only. 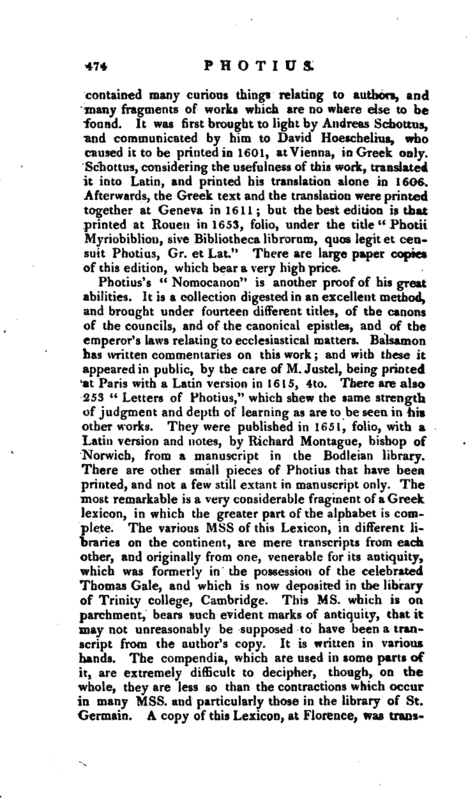 Schottus, considering the usefulness of this work, translated it into Latin, and printed his translation alone in 1606. Afterwards, the Greek text and the translation were printed together at Geneva in 1611; but the best edition is that printed at Rouen in 1653, folio, under the title“Photii Myriobiblion, sive Bibliotheca librorum, quos legit et censuit Photius, Gr. et Lat.” There are large paper copies of this edition, which bear a very high price. 1 Cave, vol. II. Fabric, Bibl. Graec.^Rees’s Cyclopædia, —Saxii Onomast.